Following in the footsteps of Incas and Spanish explores trekking along the famous mountain trail to Machu Picchu. Explore the ancient capital of Cusco and visit the colourful Pisac Markets. Stepping off the beaten track, experience traditional life with an overnight stay in a mountain village. Along the way there's the opportunity for rafting and mountain biking in the Sacred Valley. Our journey begins in Cusco, the old heart of the Inca Empire and the archaeological capital of the Americas. One of the oldest continuously inhabited cities on the continent, Cusco is imbued with an atmosphere of mystery and grandeur. The Spanish-style city of today, with its attractive pink tiled roofs, arcaded plazas and steep winding alleyways, stands upon tremendous Inca foundation stones. After a chance to freshen up and meet our local guide, we have the option to head out to explore Cusco's lively atmosphere of Plaza de Armas (main square) with its grand colonial architecture, bustling markets and iconic Inca monuments including the Inca wall at Hatunrumiyoc with its famous twelve-sided stone. The stone, measuring some 5 feet across, has the typical bevelled joints which create the patterns of light and shadow on Inca walls learning. Today is a leisurely day to enjoy the sights of Cusco. After breakfast head out on foot to explore the Inca temples at Qoricanch; a short distance from the city centre. Qoricanch (also known as Koricancha) is one of the best preserved and most important Inca temples. The inner sanctum of the temple is ornately decorated with silver and gold leaf and was reserved for the highest authorities in the Inca kingdom. The rest of the day is free to enjoy optional activities in and around Cusco exploring the winding streets and alleys of the city. In the morning we leave Cusco and head for the stunningly beautiful setting of the Sacred Valley to visit the market town of Pisac, strategically located at the head of the Urubamba Valley perhaps the most famous indigenous market in Peru. We spend time at the famous market before making our way back to Cusco stopping at Awanacancha, a llamas farm. On the northern outskirts of Cusco we stop at the temple-citadel Sacsayhuaman which broods high above the town with fine views looking back down to Cusco below. Sacsayhuaman was built to impress, with a huge zigzagging stone wall broken into 66 sharply projecting angles to catch attackers in a withering crossfire. 20,000 conscripted workers toiled for 90 years to finish this remarkable historic capital of the Inca Empire, the sheer size of the stones making up citadel are a testament to the ingenuity of the Inca craftsmen. Leaving Cusco this morning we drive through the Andes to arrive at Chequerec Community, a typical Andean village where we will start to trek through narrow paths traditionally used by the locals. During this hike, we will see small indigenous villages, cultivated fields, peasants working, curious children and a variety of animals as well as a varied flora. This is a great opportunity to discover different lifestyles and be in contact with the natural atmosphere of the Andes and its people. After a few hours of walking, we will arrive at the community of Misminay. Located at 3,700m, its location is spectacular as a natural balcony from where we can look at the splendid landscape and snow - capped mountains that surround the Sacred Valley; this view certainly astounds and leaves a deep impression on all those who visit this place. We will be received by the people of the village, and welcomed with a typical sweet spearmint tea; this agreeable herb is edible and medicinal for this people. Families live together in tiny, one or two-room adobe homes raising guinea pigs, cows and sheep. Fathers work as porters for hikers during the dry season and tend crops of potatoes, corn beans and quinoa during the wet months, while mothers watch the herds, take care of the household and raise their children. Women also weave, producing the family's colorful ponchos, chullos, skirts, shawls and other items, on their backstrap looms. After lunch we will have a demonstration of weavings made by the women of the community who will show us traditional and ancestral techniques. There will be also the opportunity to learn more about the local agriculture, they will show us instruments used by the Incas and still used today, especially in the highlands. Tonight we will take dinner at the community meeting room before overnighting at a local house. After breakfast, we leave Misminay for some easy downhill biking lasting for a few hours. We will drive from Misminay to Cruzpata in the pampas of Chinchero. Here we will practice with the bikes before beginning our route along a hilly track (single track , dirty road and down hill, helmets are provided). We pass the Huaypo Lagoon to reach the experimental Agricultural Site of Moray a very unique archaeological site which consists of enormous natural depressions or hollows in the ground surface that the Inkas used for constructing irrigated farming terraces around them. This place was an important center of domestication, acclimatization and hybridization of wild vegetable species that were modified or adapted for human consumption. After a short visit at this site, we continue by bike toward the town of Maras. 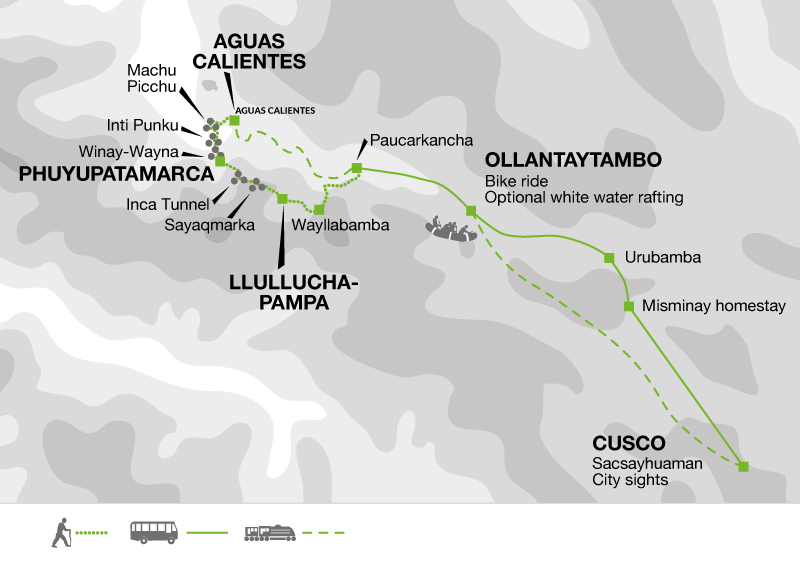 After visiting the Salineras of Maras (Salt mines), we have a 30-40 minute descent walking to Pichingoto in the Sacred Valley, crossing the Urubamba River where our private bus waits to transfer us to Ollantaytambo town. Our base at Ollantaytambo makes the perfect place from which to discover the sites and activities around the Sacred Valley. Today there is the option for a full day's rafting of the white waters (grade 2-3) of the Urubamba River before returning to our comfortable accommodation in Ollantaytambo to prepare for the forthcoming Inca Trail. Day 7 - Start the Inca Trail trek with overnight camping in Llaqtapata (2700m). Today has been left free for some rest and relaxation in Cusco after your trek. It will also be the perfect time to visit the markets and shops in the old City to take back some lovely souvenirs before your flight home tomorrow. Depending on flight times we may have some free time in Cusco this morning. Aguas Calientes - Hot springs US$ 4. Sacred Valley - Rafting on Urubamba River US$ 65 depending on numbers. Huayna Picchu Mountain- £60; Machu Picchu Mountain £60 - Subject to availability - these must be pre-paid at time of booking and is non-refundable. If you change your passport between your time of booking and prior to travel please take your original passport with you to avoid being fined. Lima - City tour approx. US$ 28; Gold Museum US$ 58 guided (minimum 2 people), US$ 11 unguided; Lima detour - alternative view of the city of Lima US$ 30 (price may go up if less than 4 passengers). In the highlands, conditions are generally dry and sunny during the day. Nights can be very cold at altitude so it is essential to bring adequate warm clothing for the trek especially between May and August. It can drop as low as -10°C at night. Be prepared for rain. Take your swimming costume for the thermal baths at Aguas Calientes. A sunhat is essential. Comfortable around camp and much more practical (and warmer) to sleep in than pyjamas. Useful around camp, in towns and when travelling. Sandals are ideal for rafting as they protect the soles of your feet and also keep them cool. Comfortable shoes and sandals. Please see notes regarding trekking boots for Inca Trail. If participating in rafting old trainers (as they get wet) are useful. Main Baggage: Your main piece of baggage - suitcase or rucksack - must be lockable as this becomes the receptacle for anything you don't want on the trek and this is stored at the hotel in Cusco while you are trekking. Trek Kit Bag: Before leaving Cusco there is plenty of time to re-sort luggage into what you need on trek and what can be left in Cusco (see above). Your trek luggage, including sleeping bag, needs to be packed into a kit bag, soft holdall, frameless rucksack or similar to be carried by the porters. The weight limit for this is 7kg but you will probably find that you do not need this much. Small Rucksack/Daysac: During the course of a trekking day, you do not have access to the luggage which is being carried for you by the porters. In any mountain region the weather can change rapidly and you must be equipped for this eventuality. Your daysac should, therefore, be large enough to carry the following: Waterproofs, sweater, long trousers (if walking in shorts), warm hat and gloves, sunhat, sun cream, water bottle (at least 2 litre or 2 1litre bottles), tissues and your packed lunch. Most people normally find that this adds up to about 6kg. Camera equipment can be heavy so think carefully when deciding what to take. Other optional items in a day pack might be a diary or a book to read at lunch time. Sleeping Bag As you do not carry it yourself this may be down or synthetic, but it must be 4-season (temperature -10°C to -5°C). A cotton liner helps to keep your bag clean. You do not need a foam mat as thermarests are provided. Note: it is possible to hire a down sleeping bag locally for US$ 20 for the whole trek. Let your tour leader know at the beginning of the tour. Trekking poles are recommended. NB. Metal tipped trekking poles are NOT permitted in order to reduce erosion - please ensure they have rubber/plastic tips. Wooden poles are readily available locally. Water along the trail must never be considered as drinkable. The camp staff provide purified water each day with which to fill your own bottle. 1 litre is the minimum size suitable as disposable plastic bottles are not allowed on the trail. It is a good idea to add some powdered fruit juice for flavouring. Note: Metal bottles can also double up as hot water bottles. A small torch is essential for finding things in your tent, visiting the 'toilet' in the night etc. Often a head torch is the most practical option as it allows you to have both hands free. Remember that in most developing countries only a limited selection of batteries is available. The most common are pen cells (or AA size) and SP/HP2 (D size). If you pack bits and pieces in plastic bags inside your kit bag they will stay dry in case of rain and it will be easier for you to sort through in camp. Remember, the less you have to unpack in the evening, the less you have to repack each morning. A binliner to pack inside your daysac is also a good idea. Try to keep heavy cosmetics etc to a minimum. Essentials are toothbrush/paste, soap and a small towel. Wet Wipes are great for a quick clean up in your tent, so bring a pack of those. All cooking and kitchen gear. A branded Explore kit bags on the Inca Trail is provided for you (you get to keep this bag). Your luggage is not taken on the actual trail and this kit bag is used to carry your personal belongings while undertaking the trip. Peru: Visas are not required for UK, New Zealand, Australian, US and Canadian citizens. Other nationalities should consult the relevant consulate. All visa information is subject to change hence you should confirm all visa related issues with the relevant Embassy prior to departure. Why not extend your holiday with some time in the Amazon. Hike through the jungle, go wildlife spotting and stay at the Eco Amazonia Lodge in the indigenous community of Infierno. Click here for details. Imagine the bragging rights for the whole family after the holidays when explaining that your family met the challenge of the Inca Trail and visited a wonder of the world, Machu Picchu. Probably our best challenging adventure and perfect for active families who enjoy walking and undertaking a journey of exploration.